After last year’s jaunt into the Mexican heartland it was clear there was more fun to be had in that immensely rewarding country, and so we ventured back. It seems few people give the bottom end of N America the attention it deserves, preferring Asia etc., for some reason. Big mistake, I say. Much research has been undertaken over the last year by myself and colleagues into such fascinating and handsome genera as Beschorneria, Furcraea, Dasylirion, Agave and, rather dissimilar to the former, Dahlia and Eryngium. Most of these genera have their centres of distribution, or highest numbers of species found, in Mexico. Some might ask why a British plantsman is so interested in supposedly tender and ungrowable plants for the UK climate. I would reply that it is simply not the case, with many Southern or Western gardens growing many species with ease, given adequate growing conditions. Most important to remember when experimenting with many Mexican plants is that winter over huge areas of that country is mainly dry, so drainage is vital, and the sun is considerably stronger, so many things that grow in semi-shade there will prefer full sun in our softer climate. This year’s trip was to be one that followed a similar path to that of last year; in essence, an approximately 2000-mile round trip up through the Sierra Madre Oriental, concentrating on a closer look at the best bits from last year, and of course visiting many new areas along the way. Such is the diversity of habitats, and of course plants, that I would happily spend another 10 trips searching through this vast mountain range, let alone the rest of the country. After a long overnight flight from London Heathrow via Madrid, Paul Spracklin and I arrived early in Mexico City just as the place was revving up for the day ahead. Soon we were settling into our hired Jeep and heading out of town in the direction of the second highest peak in Mexico, Popocatepetl. Within literally 5 minutes, we found ourselves being ripped off by a group of traffic cops on the look-out for pale skinned, shiny Jeep drivers. We were accused of offences that we clearly were not guilty of, and bargained our way down from a ridiculously hefty fine to a……hefty fine, though we found out later these guys and their antics should not have been tolerated under any circumstances. If you find yourself in the same position in Mexico, establish which type of policeman you are dealing with first. If they are the Federal Police, think twice about getting too cocky with them. If however they are local traffic cops, remember they are about equivalent to the British traffic warden (apparently). First, go about taking down their numbers and, preferably, their names too. Then ask them if they are prepared to go with you to the local station to discuss the matter with a senior officer. Lastly, for a quick solution to the matter, offer them a maximum of about £10 Peso equivalent for their drinking fund, and no more. Cheeky buggers. So, after our re-introduction to the ways of Mexico City, we were soon moving SE out of town on our way to the second highest peak in Mexico. In stark contrast to Pico de Orizaba, which lies about 90 miles to the direct East, Popocatepetl is wetter on the West side. To be honest I was expecting more, botanically, from this volcano, though of course one only sees a snippet of the vegetation from the only road over the top and, hell, we probably missed a ton of fabulous things. However, some old favourites reared their heads at about 3200m. Amongst the Abies forest as we climbed, a lovely softest pink-white Dahlia aff. merckii was seen, still in flower (most dahlias of this type are in full seed at this time of year). What appeared to be Salvia fulgens was here too, though had paler calyxes in comparison to the ones we found just to the North last year. It apparently only grows in a restricted area of the central volcanic belt. Up higher, the vegetation changed to Pinus hartwegii forest with an understorey of soft grasses, all bleached and golden and probably a Stipa species. Amongst these grasses one could occasionally find a good chunky form of Eryngium proteiflorum, their seed heads wonderfully silver and spiny. The road to the highest point was blocked by an army checkpoint, so on we went, over and down the other side with a great view of the volcano Malinche in front of us, about 30 miles to the E. Of all the volcanoes in Mexico it surely has one of the finest profiles; a great broad cone with softly tapering flanks, as if the Devil had thrust up a mighty finger from below into a taut Earth’s crust and held it there for all eternity. Having said that, it is better from some angles, as it is not altogether perfect in form, especially at the summit. Puebla was to be our host for the night, and she turned out to be a lively, fairly cosmopolitan city with a good vibe, though we had not expected the long drag through the suburbs to get to the centre. Today was to be Malinche day, and the maps we had purchased previously indicated one or two small dirt tracks ascending to a fair altitude. These were marked as roads, so we started out to find one of them. Driving in Mexico, especially off main roads, is not always the easiest thing, as signs are few and far between, though using a mixture of maps, heavenly bodies and local folk seems to keep one heading in the right general direction. We found ourselves at a bit of a loss at one point and stumbled upon two local lads who seemed happy to help us with our plight. It is probably significant to mention at this point that neither of us speaks much in the way of Spanish. Nonetheless, we were soon on our way in the right direction, and after five minutes of bumpy track it became clear, through a combination of mime and pidgin Spanish, that the road in question, leading to the village high on the volcano, was not in fact intended for motor vehicles, and a good deal of walking would be needed to gain any reasonable altitude. We are not what you might call ‘lazy buggers’, but the decision was made there and then to turn round and leave Malinche for another day, one of the reasons being that it could have been, in certain ways, as disappointing as Popocatepetl. So, after dropping the lads back in their village, we were soon on the highway heading NE toward Xalapa, stopping to admire Nolina parviflora near Zacatepec, Puebla. 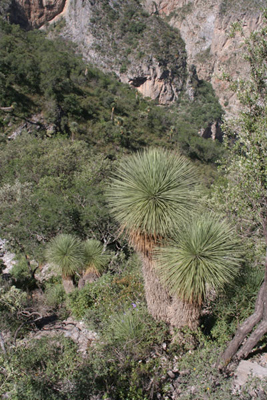 The plants inhabited dry hillsides with Yucca filifera, Dasylirion acrotriche and a fairly glaucous form of what appeared to be Agave salmiana ssp. crassispina. An easy drive across the high dry plains, with great views of the foothills surrounding the volcano Cofre de Perote to our right, brought us quite suddenly, after the town of Perote, into thick fog and an instant change in vegetation. We were now in the cloud belt amongst the graceful, beautiful Pinus patula, with ferns at the side of the road and Tillandsia sp. on the branches of the trees. As we started the descent to Xalapa through the timbered lava fields on the flanks of the Cofre, we were quite suddenly amongst Agave polyacantha var. xalapensis. These smooth-leaved, light green agaves are suited to a moister climate, and happily exist under the canopy of Pines and Alder. They make a quietly handsome, fairly small species with a similarity to A. celsii; however, far more exciting to us was a sighting of Agave atrovirens var. mirabilis at the roadside mixed with A. salmiana in a typical hedgerow planting near Las Vigas. We were expecting this species here, and quite how I missed it as we drove in the other direction last year I do not know, but no matter, we were heading down into the warmth, humidity and obvious tropical flora of Xalapa and a bed for the night. Another lively place, Xalapa is a pretty funky city by Mexican standards, though trying to end up where you are supposed to be without the aid of the sun of course knocks one string from the bow, as it were, and a good tour of the city’s highlights was enjoyed from the car window before finally arriving at our hotel of choice. If you were thinking you had heard the last of the fabulous Agave atrovirens var. mirabilis in the last paragraph, think again, as today we were on a mission to find a good colony of this most magnificent of giant ‘Magueys’. I, and other colleagues, had found this species last November on Pico de Orizaba in full flower with inflorescences to about 10m tall, and needed to renew the acquaintance, so back up to Las Vigas we went. The morning was clearer, allowing inspiring views up the slopes of the Cofre to the summit over layers of extremely healthy deep-green pine woods, consisting mainly of very tall Pinus patula and Pinus montezumae, both as handsome as a pine can be but with the added bonus of the P. patula glistening from its extremely pendulous shiny needles. It didn’t take too long to find our Agave when we reached the village, though we did have to scan the hedgerows of a few dozen fields; these hedgerows made up virtually entirely of Agave salmiana, which necessitated a good deal of mental and visual ‘sifting’, as the profile of both species has many similarities, especially when young. The key point about the variety mirabilis is that it has a pale blue-grey glaucous covering to the leaves which does help it stand out to some degree. After admiring a few good-sized plants, and lamenting the lack of even one flower spike, we started our return to the main road via a different route. Much to our delight we found another specimen greater than any seen previously, without flower, but a huge and perfectly formed beast 2.5m high by 4m across. There were baby plants here and there amongst the grass, but they weren’t suckers, as this species only reproduces naturally by seed. The natives know however, that by removing the emerging flower stem, plantlets will be produced at its base amongst the upper leaves, which can be removed and planted when of a reasonable size. Very near our giant plant was the remains of another which had had its whole crown removed, leaves and all, leaving only a stump which, much to our amazement, had sprouted a couple of pups. To see it re-sprouting from below crown level was very interesting. From here we headed North with the general plan of reaching Ciudad Victoria within 5 days, though also with some definite ideas of what we wanted to see and do. So, for the rest of today we would be mainly covering old ground as we headed toward Zacapoaxtla, Puebla, via Teziutlan. Although not far as the crow flies, this journey took the rest of the day. It took only a brief drive to leave the moist environs of Las Vigas and find ourselves back up on the high, and at this time of year dry, plain surrounded by vast fields edged by lines of a poplar species in autumn colour. Very soon it was ‘all change’ again, as we lost some altitude as well as gained some influence from the Gulf, and the roadside vegetation became lush and thick with the occasional Ensete ventricosum (a giant banana relative) showing itself, sometimes in full flower, looking truly bizarre with no leaves and only the giant, fat, drooping flower spike arching out into the road. A wrong turn at the town of Teziutlan (just over the state boundary into Puebla, and obviously following the example of abysmal road signing set by Veracruz) took us further down into the moist tropics before we realized it just wasn’t ‘looking right’ and turned around. Before we headed back up, we stopped to admire countless specimens of an unidentified Cyathea sp. These tree ferns were spread liberally about the steep, grazed fields and were obvious remnants of former mixed forest. After a few miles of steep climb into the mountains, we passed a little town called El Mirador and found one of last year’s interesting sites situated at the base of a limestone cliff (aren’t limestone cliffs always interesting?). Above grew an impressive oak, Quercus candicans, with its large, broad foliage with off-white undersides, and around us were found at least 2 or 3 other oak species, Garrya sp., Salvia aff. elegans etc and, just below in a grassy area, a handsome unidentified Agave with a tall slim inflorescence and a rosette of not particularly long grey-green leaves. With not much of the day left, we reached Zacapoaxtla, a rather unexpectedly handsome little town with a good proportion of mostly original architecture and populated by friendly indigenous natives, most particularly the lovely lady on the desk at our chosen hotel, which overlooked the zocalo (central town square). The buildings in this part of Mexico can have very deep overhanging eaves and shallowly pitched roofs, presumably taking the relatively high rainfall into the street and avoiding the need for guttering. This all makes for a distinctive vernacular, and a pleasant after-dinner stroll was enjoyed. Last night we left our Jeep parked in a quiet side street. This morning we rose to find it engulfed by a market place, with boxes of shoes beautifully stacked and arranged within inches of the doors. This did not, however, put us off enjoying a good breakfast before moving it; after all, how were we supposed to know? We are obviously just dumb tourists who need signs for everything. In true Mexican style, smiles greeted us as we sheepishly made our way to our vehicle; they seemed not the slightest bit bothered, no doubt sure we would arrive before the market got going, once again proving how laid-back and happy these natives are. Today was a trundle over old ground again as we headed for Tulancingo via Tetela de Ocampo, but nothing could prepare us for the destruction caused by the rain that came with Hurricane Wilma which had brushed nearby Veracruz only 3 weeks previously. Not long after leaving Zacapoaxtla we stopped to admire some roadside weeds which included the lovely Amicia zygomeris, which, not so strangely, didn’t look quite as exotic here in Mexico as it does back home; also the ubiquitous (in this particular climate) but very handsome Bocconia frutescens, a rather unconvincing member of the poppy family and closely related to Macleaya. 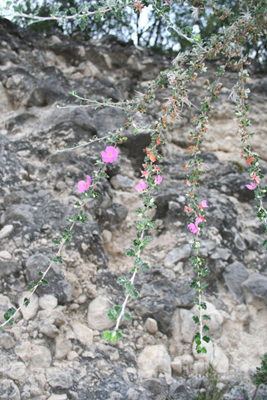 A pretty climbing plant scrambled over the rocky bank by the roadside, with large bright pink deep throated flowers. It turned out to be (probably) Lophosperum erubescens, a member of the Scrophulariaceae. The road to Tetela, at which we gawped last year in regard to its seemingly piss-poor structural engineering, certainly didn’t stand up well to the extreme conditions that Wilma brought. It was rather amazing, and shocking to boot, to see a new road virtually destroyed by water. The erosion was horrendous, with great cracks in the tarmac and whole chunks of highway fallen away down very steep banks to the side. We constantly had to dodge vast piles of sand, rock or mud deposited in our way (the main reason for the excessive erosion here was the sandy nature of the ground), and often full size Agave salmiana were strewn across the road after losing their footholds from the fields above. In many places where small rivers once passed under the road there were now huge chasms necessitating a drop down of sometimes 20ft or so to ford the now trickling stream. and what appeared to be a Taonabo species amongst the pines and oaks, the latter an obscure member of the tea family. Passing through a huddle of dwellings, we were forced to jam on the brakes sharpish when we suddenly found ourselves in the presence of purest unadulterated beauty. No, not a fair Mexican maiden, but the most gorgeous of agaves hanging out over the road from a garden that had lost a few square metres of surface area in the rains. This mama was huge, icy blue and with rigid leaves to boot, turning out to be A. americana var. oaxacensis, a plant naturally of the South but often found as a cottage planting elsewhere. The friendly natives soon appeared and were keen to communicate, though our lack of Spanish rather kept things quieter than we would have liked. That is until the brother from next door was summoned; he had worked in L.A. and could speak our mother tongue (no matter where you go in rural Mexico you always find someone who’s worked in the States). Further along, we came to an area where what appeared to be Agave kerchovei appeared by the thousand on the South-facing rocky slopes and cliffs. They shared these apparently hostile conditions with big tillandsias, reminding one of the high humidity and reasonable rainfall areas like this enjoy in the summer months. The oaks were hung with Spanish moss, and in the grass shone the brilliant vermilion flowers of Silene laciniata. Before long, we reached Tetela de Ocampo and started to see large numbers of the lovely multi-stemmed Brahea dulcis by the roadside. This really is a very attractive palm, deserving of wider planting in warm parts of the world. In this population, the leaves were variably grey-green with rigid segments making perfect fans. Trunk height was never more than about a metre, and often much less. Further along, just past Tonolapa, we stopped to admire these beauties up close at the same spot where we botanized last year. At their feet in the rough grass was a handsome blue Agave which superficially resembled an A. americana ssp. protamericana. Some leaves had scabrous undersides, others smooth. After a scenic drive over the mountains, past lakes and forests, crossing the state boundary into Hidalgo on the way, we arrived at the town of Tulancingo, a place seemingly founded on textiles. Tonight’s accommodation was dirt cheap and felt like it, the sort of place where one didn’t feel too keen to use the shower, not least because of the bare wires hanging out of the electrical installations. A trip into the centre for our evening meal found us in the restaurant of the ‘nice’ hotel in town where we were to experience once again the friendliness of native Americans (they are very keen to push the point that they are American too, and that the USA is hogging this title for themselves). This morning we took an early stroll around the town centre in the brilliant sunshine as the place woke up. Tulancingo is not a pretty town, and the only thing I could think of as we walked around the zocalo was ‘Plymouth, Devon, UK’, which I think sums it up nicely. The saving graces of this ugly place were the giant trees that dominated the same zocalo, being mainly Fraxinus uhdei, a very large growing, generally evergreen ash from Central America and Mexico. This morning we had plans to head back the way we had come for a short distance, to search for Dahlia neglecta which was described from near here. Not far from town, we pulled up amongst the dwarf oaks and prickly pears in a landscape that obviously isn’t blessed with a very high rainfall, and started our search. Approximately 5 minutes later, we found what we were looking for, which was rather a surprise, but even more of a surprise was something that for all the world looked like a rather unappealing clump of grass but to us appeared to be a Nolina sp..
No Nolina sp. of this type is recorded from anywhere remotely near here so, who knows, it may be a new species; but without an inflorescence on any of the plants it was hard to say. Another plant of interest was a tiny suckering Agave sp., which has turned out to be A. applanata. This species has a very distinct difference between its juvenile and adult growth forms, with the babies looking like a plant known in the trade as A. patonii (syn. A. parryi), but the adults becoming considerably larger with full rosettes of rigid icy-blue leaves lined and tipped with dark teeth. We could find no adults anywhere, but Greg Starr of Tucson, Arizona, had previously found this species only a couple of kilometres away with both adults and juveniles in the same population. Happy with a good morning’s botanizing, we set off for Parque Nacional Mineral del Chico which sits above the sprawling concrete ugliness of Pachuca, in the Sierra de Pachuca, which rises to just over 3000m. We decided to take a back road into the park, which turned out to be very interesting, noting an exceptionally handsome Mahonia pinnata subsp. moranensis clothed in dark, glossy, relatively small leaves and leaflets, densely set on the branches. The leaves were glossier than others seen elsewhere in Mexico. The huge, almost climbing, Philadelphus karwinskianus was found on the cooler, shadier slopes, with cream flowers ageing to primrose yellow, and the rare Beschorneria yuccoides subsp. yuccoides (as opposed to the far more common subsp. decosteriana) was also seen on the way up the winding track. As we reached higher altitudes, the views out of the park over the surrounding plains were fine, and the occasional glimpse of bare rock rising majestically above the spruce, fir and oaks on the highest peaks became frequent later: a feature of the place. Salvia mexicana with calyces in both the bright green and black colour forms were commonplace, as they are over vast areas of Mexico, though in Hidalgo they never seem to make a very large plant as they can elsewhere, usually attaining only about 1-1.5m. At about 2500m we passed through some woods with tall oaks and firs festooned with huge Tillandsia violacea with rosettes to about 45cm across. They had striking pendulous inflorescences in shades of red, sometimes scarlet, and appeared to be the same species we found on Pico de Orizaba last year. This is almost certainly the case, as I believe the number of species found at this altitude is severely limited. After the pretty mountain village of Mineral del Chico, and a steep winding climb through the dense cool forest to roughly 2900m, we reached nearly the highest point the road attains here and there, above us, perched on some huge slabs of rock, were the finest Beschorneria we had ever laid eyes on. These were huge with particularly good blue foliage but, more importantly, they made such handsome rosettes of rigidly radiating leaves. Of course, the reason they looked so good was revealed, after a few more twists in the road, when we found some standing on huge trunks. They were in fact Furcraea parmentieri (syn. F. bedinghausii), not a Beschorneria sp. at all. I and other colleagues have often found it hard to tell the difference between the two genera as babies in pots, but when Furcraea start to form trunks it makes things a trifle easier. One plant, at the edge of oak woods high above the road, had flowered during the summer and was now an incredible sight. No flowers left, of course, but hundreds of plump bulbils dripping from the pendulous branches of an otherwise erect inflorescence of immense size. This scape was visible from quite a distance and measured roughly 6m from the top of the trunk, which was itself about 4m and now covered in dead drooping foliage, all goodness from it being drawn into the plant to create that mighty inflorescence. On this occasion, we attempted to view this floral wonder up close, but failed; however, we would return to it on our route south. After some thought, it has become apparent that these F. parmentieri are certainly slightly different from any I have seen in cultivation in the UK and the Mediterranean. They are a particularly fine form: the leaves exceptionally blue and broad. As this is one of their most northerly outposts, plants from this area could possibly prove hardier than those in cultivation. Although failing to reach the fruiting Furcraea this time, we did, on the supposed route toward it, find a rather nice form of Agave salmiana basking between the rocks. This species is very variable, always handsome, but this one was a tad more refined than most, and although being squat and fat it was perfectly formed and not quite like anything seen in cultivation by either of us before. The most remarkable feature of the plant was the thickness of the leaves compared to their length, being at their bases almost round in section, a little like a body builder’s forearm. We christened this clone ‘Otomi’ to honour the Native Americans of the region, which do indeed share some of the physical qualities of this beauty. The sun was setting and we intended to be further north by evening. Quickly we left the park, the tall dense conifer forest behind us, dropped down off the Sierra into the wide dry plain and skirted the low-rise concrete ugliness of Pachuca. Although a nasty looking place, Pachuca is interesting on account of its regional speciality…the Pasti, advertised everywhere. These are, as one may imagine, Mexican versions of Cornish pasties, the dish being brought here by Cornish tin miners in the 19th century who were here to make their fortunes in the silver mines found in the very mountains we’d just been exploring. Along the same lines, one forgets that football hasn’t always been played in Mexico, such is the passion associated with the game, but it seems the miners may also have brought that with them from the UK. After an easy drive, the market town of Ixmiquilpan was soon upon us and a very cheap, clean, modern hotel in the centre of town was easily found. Whilst diaries were being filled with notes as we put our feet up in our room for the night, something was stirring in the zocalo outside. Car horns were starting to be blasted in a sort of monotone tune, the sound of a large chanting crowd could be detected in the distance. Before long this crowd of revellers were in the zocalo and the noise was immense. Not only were the people roaring out some sort of victorious chant, but the car horn blasting was now constant. The crowd appeared to be circling the zocalo for roughly half an hour keeping the same routine going. I say ‘appeared’, as neither of us could seem to muster the energy to get up and see what was going on, always expecting it all to peter out at any moment. On reflection, it must surely have been a football win that day. Monday, it would seem, is most definitely market day in Ixmiquilpan, and boy, what a market it is. Many people talk of markets they find in various obscure parts of the world stocking everything one could possibly need, and I too will be no exception. This place was huge; not only did it take up half the streets of the town but, as one pushed out into the countryside, there were still fields full of flat bed trucks and pick- ups trying to offload vast quantities of fresh produce. Wholesale, retail, anything you needed, it was there. The Rio Tula and its fertile plain no doubt had something to do with Ixmiquilpan’s prosperity, giving rise to fields of fresh greenery on both sides as we headed NE out of town. The contrast that came with the cessation of irrigation a few miles out could not have been more stark. We were immediately amongst cacti and succulents, mainly Agave salmiana (as a crop), Cylindropuntia sp. and Agave difformis. It was the latter we had hoped to find here, and sheets upon sheets of suckering colonies we found, all growing in what seemed like pure broken rock, which it probably was. Though rather similar to the ubiquitous Agave lechuguilla, it is variable, with some forms bearing wonderfully serpentine leaves. We didn’t find any really extreme forms but did notice a little wiggliness in some of the foliage. One or two of the Agave salmiana here looked like they could be hybrids with mapisaga such was the narrowness of their foliage. From here, we started to climb steadily into the mountains, passing some fine Echinocactus platyacanthus barrels along the way. As we gained altitude, we were amongst the dwarf oak and juniper forest, tarmac having turned to dirt road. After a wrong choice of route at one fork, we found ourselves high on the side of a mountain with wonderful views, but also a very blocked road. Rather, it was that this road was being built. Huge Caterpillars barred our way and, after a rather difficult conversation (usual language problems and the inability of some rural Mexicans to read maps or understand good ol’ hand signals and sign language) with the road builders, we were on our way back and heading in the right direction. Before long, we stopped by a field hedgerow planting of agaves; not the usual A. salmiana this time but another closely related species far less often employed for the same purpose. This was A. mapisaga, potentially one of the largest of all agaves and differing from A. salmiana mainly in its longer, slimmer, linear, less toothed foliage and rather fewer suckers at its base. Although huge, it is an elegant beast and one that should be seen more in cultivation in warmer areas of the world, though of course it is suited more to the garden than to a pot, considering its ultimate size. Presumably because of its fewer suckers it is much less frequently encountered in Mexico than its close cousin A. salmiana, though by no means a great rarity. As we neared Nicolas Flores and entered a slightly moister area, an Eryngium sp. appeared amongst the grass. It was new to me, fairly ornamental but, more than that, it was fascinating to find another species that is almost definitely not in cultivation in the UK. Reaching about 1m high in flower, its most notable feature was the very long stem leaves. Not far from here, growing from the rubble at the side of the road were some extremely tall, large leaved, semi-woody plants that were without doubt a species of Wigandia, though which one is uncertain. The flowers were a pale pink. As we were deep into the mountains, the topography along the route was ever changing; one minute climbing over a high pass, the next we were at valley bottom fording a wide but shallow river, the bridge long since abandoned and now collapsing. Near the junction with the Mex 85 we found ourselves in a small village which must surely take the prize for ‘Best school views’. Although the whole village was precipitously perched on a very high narrow ridge, the school saddled the narrowest point with steep drops and magnificent vistas to each side. Lucky kids! These people may be poor financially, but boy are they rich in natural beauty. Perhaps that might have something to do with the way they all waved and smiled as we drove past. Maybe I’m wrong, but these folks look happy. All of a sudden, a pair of single-stemmed yuccas of considerable quality appeared in view, emerging from a smallholder’s plot, but what were they? They had a lax inflorescence of a large size, comparatively smooth tapering trunks with broad swollen bases and substantial heads of fairly long and rather glaucous leaves. We later found more of these and deduced that they shared characteristics with the rare and not widely understood Y. potosina, but also with Y. filifera. The friendly English speaking smallholder had spent some time as a taxi driver in the USA and was very happy to allow us in to see his plants up close, though I’m sure he didn’t quite understand why we were getting so excited. A little further on we noted some more very fine, squat Agave salmiana just before reaching the main road at last, after a whole day on mountain back-roads. No complaints of course; it was a day of stunning scenery as well as fascinating plants. As it was early evening and still light, we decided to try and find the Dasylirion glaucophyllum I’d seen last year on the Mex 85 road toward Jacala, and within the Parque Nacional Los Marmoles, before darkness fell. Not too far along the road, we easily found it, admired some Agave mitis (syn. celsii), and turned back for Zimapan for the night, dropping down off the high ground and onto the drier plain in the process. As we arrived, I noticed a truly vast Taxodium mucronatum in a small park which we would investigate the next morning. We could find only one hotel. They wanted to charge us the equivalent of £5 each for the night, which we thought we could live with. It was on the zocalo, as usual, and opposite the very attractive block of a church, mainly white-painted, but with contrasting red-brown ornamental stone relief work and tower. Today was a very good day. We started with the mighty Taxodium in town, which was a true giant. I had wondered before at the likelihood of other monster-sized specimens other than the famous and ancient tree at Tule, Oaxaca, and here was one. It appeared to be healthy, though it had undergone considerable crown reduction fairly recently. I assumed this was perhaps due to diminishing ground water causing die-back that had now been addressed. Certainly this problem had been identified at the Tule site. Our plan today was to head West via the back roads, reach the Mex 120 road, and then head North. This looked easy on the map, but as I’ve mentioned before road signs are an infrequent luxury in Mexico, and the road I had assumed was the only way out of town to the west soon turned to the NW. Not wanting to give up on this one too quickly, we pushed on into the semi-desert scrub for a mile or two, stopping briefly to admire some very blue Agave striata. This species is highly variable in form and, apart from the good colouring, these plants were small, making tight little crowns with very narrow four angled leaves. Further along were more of the Yucca potosina/filifera, these showing rather glaucous foliage, and further still, the viciously armed rosettes of Agave xylonacantha started to appear. One or two became a rather large colony, often growing on vertical rock faces. In a virtually dry riverbed with a moist muddy bottom a plethora of different butterflies were either drinking or lapping up the salts. The diversity of colours and shapes, let alone the quantity, was amazing. Being spurred on by these interesting finds, we carried on under the blazing sun, being passed fairly often by short but very chunky trucks, either full to the brim with glistening ore or empty, each heading in different directions; quite obviously there were mines ahead. The hot dry landscape was now a varied mix of Fouquieria, Agave, Opuntia, Cylindropuntia, Hechtia and the impressive ‘organ pipe’ cactus Myrtillocactus geonomiformis, amongst others. Around a few bends we saw a short tunnel ahead. Passing through it we found ourselves suddenly looking down into a huge gorge, great mountains reaching high above, a river way, way down below and a mighty, sheer cliff behind us. Not only were we looking at a different landscape but we were surrounded by a slightly different set of plants, though including many from before. There was Dasylirion longissimum, Agave mitis (syn. celsii) and the huge Tillandsia grandis with a 1.8m branched inflorescence clinging to the vertical rock face with countless thousands of Hechtias (probably H. glomerata). Then came something more exciting than probably anything so far this trip: we were just about to get back into the Jeep when I looked down the steep scree slope below us and saw the unique and undeniable shape of Yucca queretaroensis. There was a group of them. This species was not only relatively recently described but so far, as far as we knew, only known from two locations/areas. This was a new locality for the species, and they were there in huge numbers. Once we’d seen a few we started to pick them out, with the aid of binoculars, all over the mountainsides. It was a very healthy colony, young and old spattering the slopes. Not only was this a very exciting botanical find, it was a great pleasure just to see arguably the most handsome of all yuccas, their exceptionally thin leaves (thinnest in the genus) forming perfect heads of foliage radiating out to form round crowns, the dead foliage clasping the trunk down to ground level, even on old specimens. Only after infrequent flowering does the perfect crown of leaves get deformed for a while, as the new leaves are shortened afterwards and take a few years to build strength again. We were to see many more at close quarters a little further on. Excited by our find we carried on down the most alarming road imaginable, and I speak as one who has done some bad ones and is not usually bothered by such things. Not only was this a dirt track, there was of course nothing in the way of safety barriers on the cliff side, the bends were switchbacks and we were sharing this single lane road with great puffing lorries as they roared their way up at snail’s pace, fully laden from the mine below. “Not to worry, we won’t have to pass this way again”, but how wrong we were. On reaching the bottom we found only one thing, apart from the cool clear water of the river, a tunnel and a few mine buildings: yes, a dead-end. The tunnel wasn’t going anywhere but deep into the belly of the mountain, and after a ‘conversation’ with some miners, this time quite handy with a map, we found ourselves to be way to the north of our desired route. So back up that lovely road we climbed, stopping for more botanizing on the way until we arrived back in Zimapan. Being now early evening we decided to ditch our previous ideas, headed for Tamazunchale 50 miles to the NE and just into the state of San Luis Potosi, which rather strangely took us three and a half hours on twisting and turning tarmac (stopping briefly to check out some nicely formed Agave aff. lophantha en-route) as we dropped 2500m down onto the coastal plain and into ‘jungle-like’ vegetation. The wall of wet heat that greeted us as we opened the doors of our air-conditioned Jeep when we arrived was a stark contrast to anything we had experienced since Xalapa. Today we spent the whole day driving directly north to just beyond Ciudad Victoria. The morning was considerably cooler than the previous night and, after a good breakfast, we were on our way. The lush, tropical quality of the landscape around Tamazunchale was a joy to behold. After many miles of giant heavily buttressed roadside trees, big banana leaves and giant bamboo, etc., the landscape dried out a little, not that this was desperately sad, just that the moist tropics have such a wonderful quality. As we approached Ciudad Valles, the amount of Sabal mexicana in the landscape increased considerably until the wide plain was completely studded with them, sometimes in absolutely vast numbers as far as the eye could see, in huge clumps, broken communities and individuals from baby seedlings to full sized trees. Another palm, frequently seen planted as a street tree or general garden ornament, was the lovely Cuban Royal Palm, Roystonea regia. This beauty is a very common ornamental in the tropics. Just South of Ciudad Mante, not far from the Tamaulipas state border, the Mex 85 cuts through the Sierra Cucharas by way of a gorge. The cliffs are covered in agaves (probably A. lophantha) up to 2m across, and the lower slopes populated by thorn forest and wonderful old specimens of Beaucarnea recurvata with huge swollen caudexes. As we approached we could see a vast cave looming above us on the cliff wall, so stopped for a break. This cavern turned out to have a ceiling about 45m high and at the very back, as we dropped down and around a corner in the dark, we could see light. It turned out to be a huge sink hole coming down from above, probably 60m deep. We could just make out the shape of a cycad at the edge of the vegetation above, possibly the rare Ceratozamia kuesteriana, which is found in these hills. The scenery from here on became increasingly tedious, though the view west to the mountains was always a pleasure, especially when the huge broad dome of the El Cielo Biosphere reserve and its dense virgin forest loomed out of the clouds above us. We finally made it to our destination, the Hacienda Santa Engracia, a beautiful old hotel a little to the north of Cd. Victoria. This was by far the nicest place we got to stay at on the whole trip, though of course we didn’t get much time to enjoy its charms. This morning was fairly relaxed as we waited for some Texan plantsmen to join us for the weekend, and we joined the hotel manager on a walk through the nearby El Tigre park to admire the truly marvellous Taxodium mucronatum that lined the river nearby. After lunch we headed off with our new companions to the fairly new Parque Ecologico Los Troncones which covers some of the lower slopes of the Sierra Madre not far from Cd. Victoria. As we sped through the lower reaches of the park, we forded the almost too deep river on many occasions as we weaved between huge old Taxodium, Platanus and oaks. Sabal mexicana was everywhere and a joy to see under the trees or at the water’s edge, where they made the healthiest specimens we found anywhere. Stopping briefly to look at a handful of Sabal minor, apparently unusual here, and then a Dasylirion berlandieri in seed, we pushed on and up, climbing the rough dirt track to an altitude of about 1000m where we came to rest at a cool spot next to a small stream. Under dense tree cover on a steep slope covered in thick leaf litter, we were shown a green leaved Beschorneria sp. (obviously B. septentrionalis), the dwarf palm Chamaedorea radicalis and, most interesting of all, a Hesperaloe sp. that doesn’t match any known species, that was found only last summer. An unknown Dahlia sp. with rich green glossy foliage and lilac-pink flowers was luxuriating here, as were any number of other nice things, including a beautiful Lobelia sp. with stems to only about 30cms and comparatively large, intense, deep blue flowers, and a half variegated Bocconia frutescens that threatened to get run over by our vehicles. The day was done, so we sped back the way we came in true off-road style reaching the gates of the park to find we’d been shut in. However, the smiling attendant was waiting for us and unblocked our way. Cd. Victoria was our stop-over of choice, and a suitably ordinary hotel was selected to match the city’s charms. The old pass over the mountains to the west of Cd. Victoria is well known to plant hunters who frequent NE Mexico. It is an easy route lined with fascinating and beautiful plants, especially at the higher altitudes. On the climb up, our first stop was to check out some cliffs covered in all sorts of nice things, including Dasylirion berlandieri, Agave lophantha and Hechtia sp., to name a few, with a fine Yucca treculeana by the roadside at the edge of the thorn forest. A little higher we reached the oak forest, where we stopped primarily to see Brahea moorei and Chamaedorea radicalis, which was at its most northerly natural limit here, both growing as understorey beneath the trees. The brahea is a beauty and a great rarity in cultivation. It is only small, but makes up for its size by having elegant foliage in fan formation, rich green above and striking white beneath. Great drifts of other braheas were there in more open conditions along the roadside, which fit roughly into the B. dulcis complex. A little higher and we reached the ridge, where we were amongst a huge number of Agave americana subsp. protamericana, sharing the roadside and rocks with Brahea aff. dulcis. The variability was tremendous, some huge to 2m and white-blue, others small and greener, some with very teated and toothy margins, others with diminutive defences. Broad leaves, thin leaves, reflexed tips – they were all there. The most striking plants to me were the palest, often with very dark, sometimes black teeth for contrast and many of the plants had scabrous foliage, which made me think they were actually hybrids with A. scabra. Amongst these beauties I found a smallish Eryngium sp. with glaucous foliage and white flowers, and an Echeveria with a bifurcating flower spike. We were now enshrouded by cloud and ready to push on west down into the wide valley around Jaumave. On the road down off the mountain, we saw for the first time this trip the wonderful Dasylirion miquihuanensis; without doubt one of the most ornamental of the genus, forming great globes of stiff, finely toothed linear leaves, often with uniformly twisted bristle tips. We passed Jaumave and turned off the tarmac onto a dirt road toward Magdaleno Aguilar and stopped briefly to admire some Brahea decumbens hybrids: these were not just classically icy-blue but altogether more substantial than the species and were thought to have B. berlandieri as the other parent. Not far from here was a strange agave with obvious affinities to the rare, but locally abundant, A. gentryi, but with long slim leaves. As usual, it got us scratching our heads, and although A. gentryi is quite variable, this was thought to be a hybrid with another unidentified species. Before leaving I found a superbly banded Agave americana subsp. protamericana and what looked to me like Mahonia pallida amongst the low juniper and Pinus cembroides scrub. Goats had been allowed to over-graze certain areas here and had degraded the ground flora considerably, probably over a very short period of time. On the drive back to the main road, we stopped briefly to admire a large plant of Cowania plicata: a member of the rose family with pretty pink dog-rose-like flowers, attractive wispy seed heads and diminutive leaves on a tall shrub to about 2 or 3m high. Not far from here were the La Florida eco-tourism cabins, where we opted to stay the night in basic but comfortable surroundings. Arriving in the dark after a good meal in Jaumave, we only got a glimpse of a few of the fine plantings at the cabins, which consist mainly of native plants, and most often the most ornamental of them. November in this part of NE Mexico ensures some chilly nights, and the un-insulated roof of our cabin did little to stop the meagre heat our bodies produced whilst sleeping escaping towards the stars. What made up for this was the fact our roof was made purely of Nolina nelsonii thatch. What a pleasure to see. Daylight painted a new picture of the cabins and their ‘gardens’, and after a mediocre breakfast we made time to admire large numbers of Dasylirion miquihuanensis, Hesperaloe funifera and Nolina nelsonii amongst others, also a giant, ancient, branching Echinocactus platyacanthus which must have been about 1.5m tall. Drooling over giant Agaves in gardens is all well and good, but we were now surrounded by huge amounts of botanical treasure, let alone stunning scenery, and could wait no longer to get out amongst it. Our aim today was to re-visit the mountains above La Peña and Miquihuana, the home of many fascinating and beautiful things, and at high altitude too – the road reaching about 3000m. First stop, near Palmillas, was to photograph some of the ubiquitous Yucca filifera that occur in their hundreds of thousands across the dry scrubland over huge areas of northern Mexico. Being a fully arborescent species, these make quite large specimens, similar in many ways to the more famous Joshua trees – Yucca brevifolia, of the SW USA. Not far from here, we could not help but stop again, as the south facing hillsides were smothered in a veritable garden of dry-climate lovelies, forming a tapestry of blues, greens and varying textures offered by palm leaves, agave rosettes and nolina and dasylirion crowns. A broader-leaved blue Agave striata and A. lechuguilla formed a low ground layer, what looked to me like Agave scabra and Brahea decumbens reached higher (always very icy-blue) and the wonderful Nolina nelsonii and Dasylirion quadrangulatum topped off the scene. Nolina nelsonii, which can form a sizable trunk and eventually branch, is most often a light blue, though it can be a more disappointing pale green. The dasylirion is particularly fine in this area, the crowns of very thin, linear, four angled foliage forming perfect spheres. This species and the more southerly D. longissimum look for all the world like an Australian Xanthorrhoea sp., or ‘Black boy’. Indeed the morphology of these dasylirions and their antipodean cousins is very similar, though genetic analysis has suggested them to be not closely related, botanically. The more southerly D. longissimum is very close in many ways to D. quadrangulatum though always has a far more untidy appearance in my experience, making the latter distinctly more horticulturally appealing. A little further on we had to stop again, as I noticed plants of Mahonia trifoliolata var. glauca by the roadside. This species formed dense prickly bushes to about 2m here, but in cultivation in the UK it can apparently get much bigger, though it is very rarely seen. The leaves are composed of three spiny twisted leaflets, conspicuously veined and bright blue. As we climbed the track up into the mountains beyond La Peña, we stopped regularly to savour the vegetation and views afforded by the increasing altitude. The species mix changed as we drove on, with Dasylirion miquihuanensis becoming more common and D. quadrangulatum occurring in huge quantities amongst the dwarf oaks and other scrub as we began to see the town of Miquihuana below. The latter were having a mass-flowering year, and seemingly every other plant had a tall, erect, creamy-white inflorescence standing proud of the crown of leaves, though they were still firmly in the bud stage as they wait until March or April to actually flower. Higher still, we came to the first visible plants of Agave gentryi on the track, growing in the shade of junipers and Arbutus xalapensis, and the first plants of an undescribed nolina known as ‘La Siberica’ became apparent. The pines and oaks started to become taller and the agave was now everywhere, as were an ever increasing variety of other shrubs. Suddenly the first plant of the superlative Agave montana came into view, though A. gentryi was still very much in evidence. At greater altitude A. montana became almost exclusive, though the variation amongst the plants was tremendous; some were mightily handsome, the rest plain gorgeous. The arbutus was now common, with variable bark qualities, some a rich red-brown but most in a range of creamy shades due to the darker top layer being shed; the berries were always brightest scarlet. At the highest altitudes a very white hairy form of Buddleja cordata was common, forming large shrubs. This species is extremely widespread in Mexico and is variable in form, colouring and hairiness, though this was distinct from anything we had seen elsewhere. In the moister, warmer parts of central Mexico we have seen plants forming trees up to approximately 12 metres high. This year it was interesting to find three different variegated Agave montana on the mountain. Two had bold striping in either cream or yellow, but only on one side of the plant, and the other was a rather appealing, fully, but subtly, green-variegated specimen. I found it difficult, as last year, to stop photographing the endless variety of colouring, armature and form of this extremely attractive species. We had now reached the highest point the track attains, at roughly 3000m, and started to head down the north side, savouring views over cloud filled valleys and mountain peaks until we reached a whole mountainside of Nolina ‘La Siberica’, glowing golden in the evening sun. A plant I had not expected to find here was Populus tremuloides, the American aspen, which was a picture in its autumn yellows and soft oranges, but as we headed around and down the mountain to the SW, we were in ever more arid land again and once more amidst very fine specimens of Dasylirion quadrangulatum and D. miquihuanensis, the latter as big as we’d seen, with trunks to 1m. Yucca filifera became common again, and the fine, bold Yucca carnerosana appeared in fairly large numbers as darkness fell. The lights of Jaumave beckoned, and on arrival provided us with good food and a cheap hotel. Today we started back on our long return journey South, driving all day from Jaumave, Tamaulipas to Jalpan, Queretaro, clean across the state of San Luis Potosi. The journey was not what one might call exciting, with a rather monotonous range of desert scrub to look at for most of the drive; however there were a few highpoints, such as a superb stand of Yucca carnerosana NW of Ciudad del Maiz. Low points were a constant headache, 9hrs solid driving and permanent cloud cover. On arrival at Jalpan, as we had originally intended to keep going until dark and it was only late afternoon, we headed off SW. Or so we thought. It was only about 20 minutes later, as the temperature was rising and our altitude was dropping fast, that we realised we were heading in completely the wrong direction; yes, back down out of the mountains onto the coastal plain. Headache, cloud cover (i.e. lack of heavenly bodies) and poor signing were my excuses, but there was no need to worry: we had passed many lovely blue braheas (probably B. dulcis) and found another interesting botanizing site. Stopping to search amongst the Juniperus flaccida and oak forest at 1700m alt., we found, much to our surprise, flaccid, narrow-leaved plants of what we thought was Agave striata growing not only in the shade of the trees but in moist deep leaf litter. These are apparently more likely to be the recently described A. tenuifolia. By the time we arrived back in Jalpan it was getting dark, and the clean touristy hotels seemed quite appealing. Our chosen hotel even had a coconut palm by the empty pool, which for some reason I didn’t expect to see here; it didn’t seem sufficiently ‘moist tropics’. After a quick look at the church, which I believe is one of the reasons for the tourists, we headed up into the Sierra Gorda which rises steeply up behind the town and creates a picturesque backdrop. After much climbing on a road of twisting bends, we rounded a corner to see before us half a mountainside of Otatea aztecorum; what a scene! This was our first sighting of this exceptionally graceful bamboo in the wild, and what a way to see it. The soft green, extremely narrow, linear leaves arched the culms under their weight as the plants clung precipitously to the near-vertical rocky slopes. The softly succulent Agave mitis (syn. celsii) was at their feet in the better light just above the road, making a bizarre combination. More was revealed around each bend in the road until, as quickly as it had appeared, it was gone. As we gained altitude, the vegetation became more temperate, with ferns and dahlias at the side of the road and, at last, we were back amongst that most attractive of pines, Pinus patula, and the cloud that had been with us since yesterday morning turned to dazzlingly bright sunshine. Over the top of the pass we started our descent, heading SW, and saw the vegetation quickly change as we pushed into the drier interior, with the smallish Pinus cembroides becoming frequent. Sharing the slopes with this dry-climate pine was another of the same genus, though one of quite a different appearance. It was Pinus pinceana, a small and gnarled-looking species with a semi-weeping habit and slightly glaucous foliage. On the open slopes around these pines were Dasylirion glaucophyllum, clearly visible with their rosettes of pale grey-green, and another member of the Marginatae group of agaves which we could not confidently put a name to at the time, but which looked pretty nonetheless. 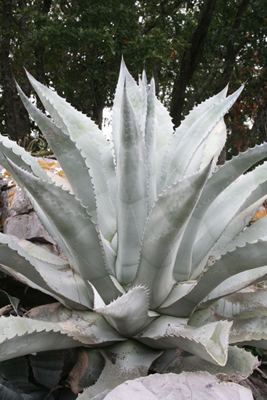 It was probably Agave garciae-mendozae: a relatively newly named species. Trying to get around to the North side of the great lump of mountain we had just passed over, we turned off the main road and into very dry country, obviously in the rain-shadow of the mountain. Passing a mummified dog hung by its neck from an Acacia (!? ), we rose again to a point where the views back to the mountain were admirable, and there found a monumental group of yuccas. These appeared to be the same puzzling species we’d found earlier near Zimapan: Y. potosina/filifera. They were a closely packed group of four about 6m high, all with branching stems and full heads of fairly long glaucous leaves, from which emerged huge pendulous inflorescences to about 2m long, packed with big fleshy seed pods. This is a species that is extremely rare in cultivation, though would be a valuable addition to the dry garden. We noted some rather icy-blue Agaves which looked like scabra to my eye and moved on until we gave up on this particular route and headed back. Back at the main road it didn’t take us long to bump into large amounts of the scruffy Dasylirion longissimum, which, we noticed, clearly possessed a thinner trunk than its close cousin D. quadrangulatum. Further on SW toward Tequisquiapan we ran into Dasylirion acrotriche again, though this time the usually frayed leaf tips were not in evidence. The landscape around us now was huge and awe-inspiring, with layers of rolling dry hills and mountains, and the sun was setting as we arrived in Tequisquiapan for the night. This place was catering for tourists coming for the hot springs, and hotels were priced accordingly, but hey, this is Mexico – nothing is really expensive. As we had one more full day before our flight home, and as we were now close to Mexico City, we decided to head back to the Parque Nacional Mineral del Chico near nasty Pachuca. After a failed attempt to cut across country to the north of the park and find another route into it, ending up in a dry stream bed in the middle of nowhere, we opted for the conventional approach. Our slight detour was not without reward, however, as we found the largest Dasylirion acrotriche var. acrotriche we had seen anywhere, measuring over 3m high with two main stems and multiple heads. 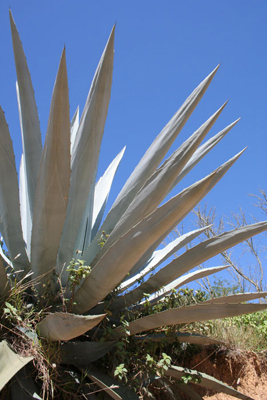 Agave salmiana was everywhere around as a pulque crop, and highly variable. Before long we were back amongst the tall conifers at altitude in Mineral del Chico, stopping to look at an interesting purple and green flowered Eryngium sp. growing in the shade of the conifers, amongst other things. Around the next bend we found ourselves in the same spot as earlier in the trip, looking up at that mighty Furcraea inflorescence standing sentinel above the trees and silhouetted against the rocks. This time we were going to go and have a close look, and after a little visual route planning we were there in no time at all, standing beneath its enormous fruiting head. After a few minutes of gawping, not only at this reproductive wonder but also at the stunning views from this 2900m vantage point, we noticed small plants of the pretty Agave filifera, an Echeveria sp. and a species of cactus growing on the great slabs of rock. Great swathes of Dahlia merckii were at our feet as we worked our way back under the oaks. Very nearby was another pricey (for Mexico), touristy hotel (with good heating), which made for a comfortable stay that night, for at that altitude it was reaching only a degree or two above freezing at night, with a ground frost clearly visible in the morning. Our last day in Mexico was spent driving to the airport across truly golden, dry arable plains with only one stop to view a large colony of Nolina parvifolia as we headed over the mountains east of Mexico City. This account, of course, fails to mention a zillion and one plants and beautiful vistas enjoyed along the way. A small book would be needed to do them all justice. Although there are many other places in the world calling for a visit, Mexico will see our ugly mugs once more at least. 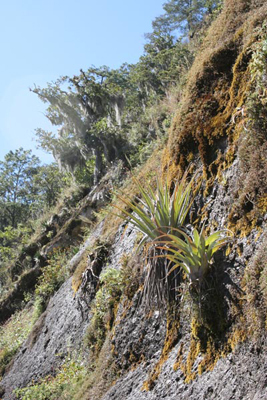 randomly came upon this blog while googling to try to id a tillandsia from guatamala, great blog! These pictures are great. I’m an artist, and was interested in the plant life of Mexico. This was a perfect find after a random google search. Thanks so much for sharing! Great description of the flora. In central Florida here I grow several Brahae..palms.